If you prefer to walk instead of riding a bicycle, Rickshaw & Hike the Colors of Bangkok will be your choice. Like our Colors of Bangkok cycling tour, this adventure gives a totally different view and experience of the city. You never see this side of Bangkok in brochures and travel magazines. You will be surprised at what happens behind and away from Bangkok’s concrete walls and buildings. At 10:00 hrs we leave from our office/lounge in Yannawa, a non-touristy district in Bangkok. We make a first stop at a typical local Thai temple with Chinese influences. The guide can give you a lot of information about the temple and Buddhism in general. After visiting the temple we walk at a relaxed pace through one of the poorest neighborhoods of Bangkok. By our own Western standards, the people you meet don’t have much, but they are so friendly and warm-hearted. Their lifestyle remains an authentic part of the Thai way-of-life. The way people live along the many canals in Bangkok can’t be seen while passing by in a tourist boat. Only walking alongside them gives you that experience. Next, we go for a short longtail boat ride across the Chao Phraya river. Once on the other side, we enter a jungle of banana, mango, papaya and coconut trees. This part of Bangkok seems out of place, but it is here, part of this vibrant metropolis. You are surrounded by lush vegetation and the best way to enjoy it is to walk. Nature lovers will feel at ease here. A little further, we arrive at a superbly designed park, where we rest a while and feed the hundreds of fish waiting at the pond. This lake also serves as a home to the park’s largest inhabitants, monitor lizards. Keep your eyes peeled near the water, if you’re lucky you may catch a glimpse of one of them. After enjoying the beauty of the park, the birds, squirrels and butterflies, the next surprise awaits…. We continue our journey in a real ‘samlor’ (Thai rickshaw or ‘bicycle taxi’) on a cycling trip through the greenest part of Bangkok. From the restaurant it is only a short rickshaw ride to the pier where a public boat brings us back to the familiar concrete side of busy Bangkok. 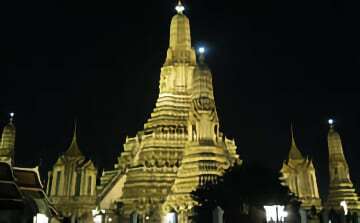 You surely will return to your hotel with many new impressions of the Thai capital! Note: On Saturdays and Sundays the samlors make an extra stop at an authentic Thai market along the canal.